Discussion in 'Amps & Cabs Emporium Archive' started by DCH, Dec 7, 2016. I hate to have to sell this amp, and am dragging my heels at doing so, but it really has to go along with a few other things after my band situation changed while I was awaiting the build. 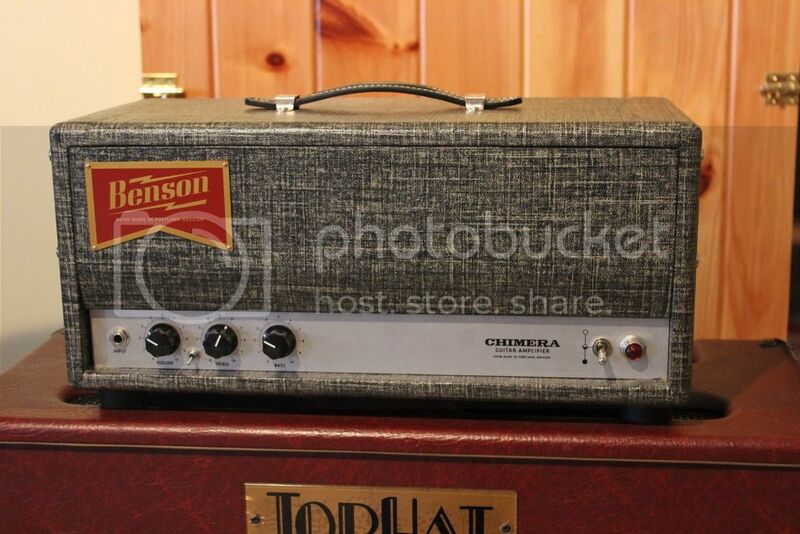 This is a custom Benson Chimera in great looking "Night Moves" covering, which I ordered with the four 6V6s biased separately in two pairs so you can pull a pair for half-power mode (ie 15 watts), and with a three-way bright switch placed between the Volume and Treble controls, which gives a subtle extra lift in chime in the up or down positions (two flavors, but subtle), or "normal" in the middle. It has its original tubes with just a few hours use on them, and is in absolutely perfect, mint condition in every way. This little head sounds superb, with great playing dynamics and a tone that runs from crisp and chimey to chewy and crunchy. It's a punchy, gutsy 30 watts in standard mode, or a more easily controlled 15 watts with two 6V6s pulled. This gorgeous amp was perfect for the band I was in when I ordered it... but that band imploded meanwhile, and I have to shift my rig to something more classic-Marshall based. Make me an offer - no reasonable offer refused! Dave, you're killing me! You ALWAYS have the best gear. I've wanted a Benson for a while. Great amp. GLWS!!! Thanks, John. And you've got a decent amp or two yourself! 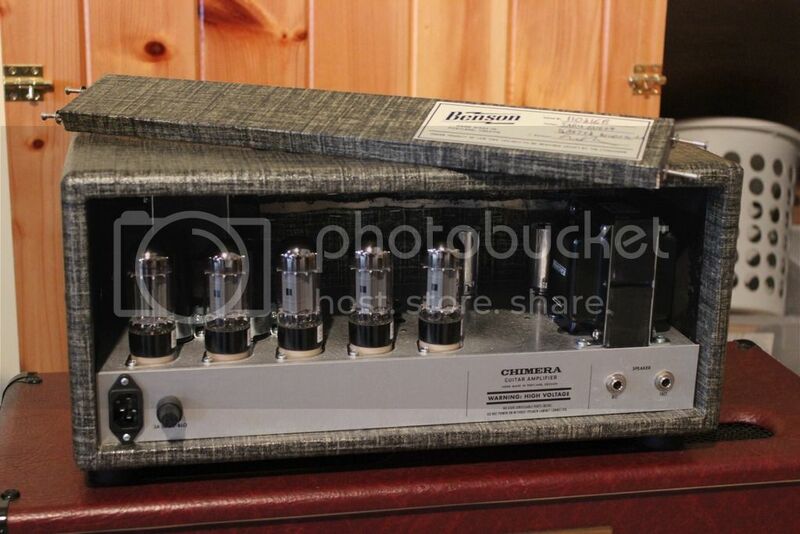 I'm really impressed with this Chimera - it has a very rich tone, and the playing dynamics are outstanding. Man, somebody needs to jump on this! Good guy to deal with too. Thanks Jeff. 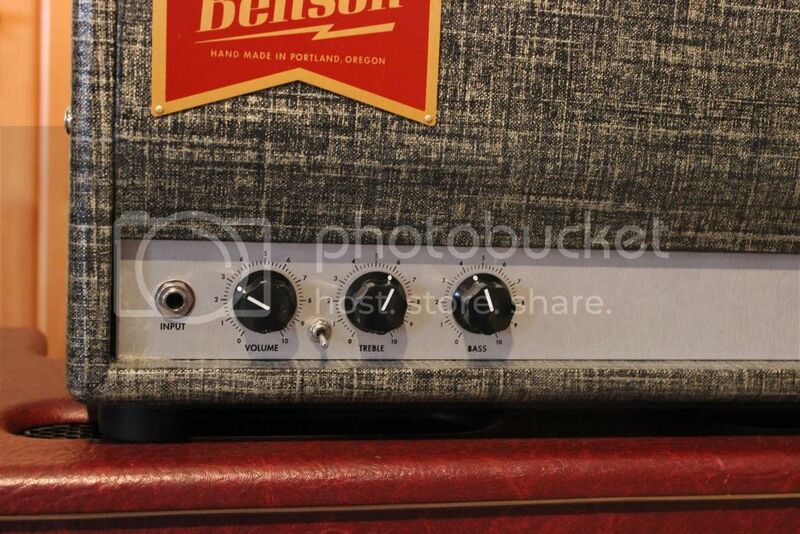 Yeah, it's a ridiculously good amp - certainly at this price, but any price really.